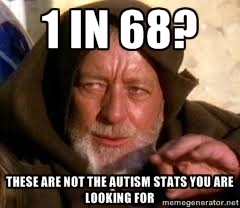 So, 1 in 68 children in the US are autistic. The report looks at the number of 8 year old children diagnosed with autism, pervasive developmental disorder–not otherwise specified (pdd-nos) and Aspergers in 2010 in 11 states. To look at it another way, children who were born in 2002 who had been diagnosed. For Canadians, parroting the CDC number is a bigger problem than it is for Americans. There are 3 big reasons why Canadians, and just about anybody else, cannot rely on this new prevalence number to say how many children or adults have been diagnosed on the autism spectrum. 1. The research isn’t intended to be applied across a national population. Prevalence of Autism Spectrum Disorder Among Children Aged 8 Years — Autism and Developmental Disabilities Monitoring Network, 11 Sites, United States, 2010 in Morbity and Mortality Weekly Report, March 28, 2104. In other words, the report doesn’t cover the entire population because it is not a “representative sample.” This report covers 11 states (Alabama, Arizona, Arkansas, Colorado, Georgia, Maryland, Missouri, New Jersey, North Carolina, Utah, and Wisconsin), which is 3 less than the last report. When the Autism and Developmental Disabilities Monitoring (ADDM) Network began, 14 states were originally selected. Each state has an institution where the data collection is conducted. Some represent a small area of the state, as in the case of Utah where the University of Utah has a surveillance area of 3 counties. 2. There is a great variation between states in who has been diagnosed. It is even tougher to compare countries. The 1 in 68 doesn’t apply in all of the states where the data was collected. The prevalence of autism in New Jersey is estimated to be 4 times greater than in Alabama. The prevalence from a region in one nation varies greatly from numbers in the latest CDC report. In 2011, it was reported that 1 in 38 children in the South Korean city of Goyang were autistic. This quickly became the “rate” for all of South Korea. 3. Which brings us to the biggest reason why Canadians should not be using 1 in 68–we just don’t know what the prevalence is in Canada. Canada has no national program to do a similar study. Even with the limitations of the CDC report, no national body exists to do that same kind of research because health is a provincial matter. The Public Health Agency of Canada might be the right federal agency to pull together the investigation, but it has few of the resources and a very different mandate. On World Autism Awareness Day, let’s spare a moment to reflect on why Canada doesn’t know what the prevalence of autism is in our country. Then, let’s reflect on what not knowing the number for Canada–or using another country’s problematic number–really means for us. In the end, it means we don’t have a clue about what we need to do to support Canadians on the spectrum or their families. No Jedi mind tricks here. Note: I don’t own either of the images I used here, but I created both using memegenerator. I do own both movies, though. I prefer The Empire Strikes Back to the original Star Wars/A New Hope. haha totally awesome post Jim. Thank you!! #Acceptance 🙂 LOVE the images. Who cares about the numbers, my kids need a world of acceptance, not statistics. Thank you! I thought if I was going to write a post that was dense with quotes and stats, I better have some cool pics to inject some humour. I am with you. The statistics tell something, but not how my kids are going to make their way in the world. Here’s a thought provoking piece for you in light of World Autism Day. The proof is in the numbers…or is it. While written to the Canadian people, he raises many points about the limitations of the study here in the states and worldwide. 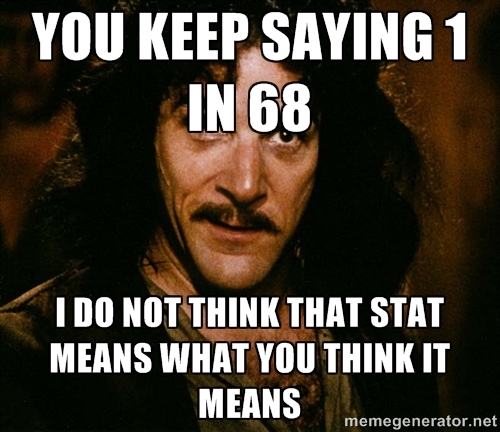 I have always disliked stats, they can be interpreted so different by so many people. I am so with you. The other reason stats make me uncomfortable, is that if we wait just a few minutes, someone will find another stat completely refuting the previous one.